Waarom is dit een drieluik? 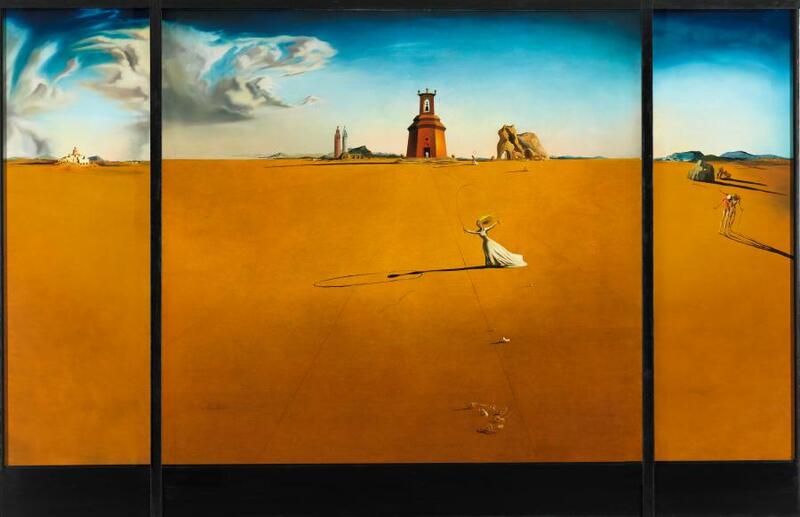 Hello, i visited the museum in Saturday and I can seem to find the quote by Dali that is next to his painting: landscape with the girl in the rope. I was wondering if you could briefly remind me what this quote was! Hi, I've just seen the Landscape with a girl skipping rope in Edinburgh. Could you tell me the dimensions? It's very impressive! Thanks, Ailsa. What was Salvador's main idea behind this painting. What is the story behind it? Is the frame around the painting "Girl Skipping Rope" the original frame? Hoe groot is dit doek? Dalí made this triptych for the house of Edward James, the eccentric Englishman who supported him financially. The girl with a skipping rope symbolises a happy childhood memory. Her form is echoed by that of the bell in the tower. The figures on the right, one half skinned, could be Dalí and his dead older brother after whom he was named.